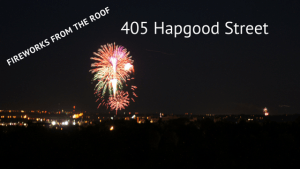 Fireworks from 405 Hapgood | Kearney Realty Co. The conventional place to watch the fireworks in Boulder is from Folsom Stadium. But this year I watched them from the roof of my listing at 405 Hapgood. 405 Hapgood is located on the lower slopes of Flagstaff Mountain and has 180 degree views of Boulder. The house is a great candidate for a remodel or a scrape and rebuild but what a place to host a fireworks party from your rooftop deck cladding! Here is a video that shows the finale from the 2017 Boulder Fireworks Show.